This second article focuses on Charles Louch and his Rainier Valley farm. I discussed Louch previously in the history of Seattle’s original upscale grocer, Augustine & Kyer. According to a 1904 passport application, Charles Louch first arrived in the United States from England in 1879 on the Allen Line steamer S. S. Peruvian. He apparently went straight to Seattle and opened a store at First and Columbia. The Seattle Public Library has a copy of the below 1878 photo with Charles Louch attributed to the A-frame building in the center of this excerpt. Obviously he didn’t travel back in time, so the writer must have been indicating occupants soon afterwards. Louch quickly cemented his place not only as a grocery retailer, but as a leading wholesaler in the city. He was also apparently not afraid to experiment. In 1888 Louch entered a partnership with William Johnson to catch fish and sell it wholesale. They leased a number of vessels including the schooner yacht C. H. White to fish for halibut on the Flattery Bank near the mouth of the Straight of Juan de Fuca. Halibut had been mainly a Native American industry prior to 1888, when three New England vessels sailed around the tip of South America for sealing and fishing. As described by Kit Oldham in a 2008 HistoryLink article, the Oscar and Hattie made the first catch but the Mollie Adams brought in 145,000 pounds in four trips that Spring. According to a 1894 bulletin by the U.S. Fish Commission, Louch and Johnson followed them in the fall of 1888, bringing in 100,000 pounds of halibut with the C. H. White alone in three trips. After less than a decade on the Puget Sound Louch had already acquired the Seattle Spirit and was not going to let Eastern capitalists strip Seattle of its wealth. There was at least one other intriguing venture by Louch. So far I have not uncovered any details, but in the 1892 city directory Louch listed himself as a grocer and seed merchant. The following year he entered the grocery partnership of Louch, Augustine & Co., ending any mention of his seed activities. Louch showed up in the city directories living downtown and on the shoulder of First Hill. But his response to the 1900 census revealed another home, south of the city in the Rainier Valley. Today Seattle’s Rainier Valley is a group of neighborhoods extending along Rainier Avenue from Interstate 90 to Lake Washington. It’s remembered as a farming center that provided fruit, produce, poultry and dairy products to the farmers’ stalls at many public markets around the city including the Pike Place Market. In particular most histories, such as the recent Department of Neighborhoods Southeast Seattle Community History Project, focus on it as the Garlic Gulch, a nickname the Rainier Valley picked up from the large number of Italian immigrants operating farms. Louch predated them. He purchased land by 1888 and built a brick estate on a hillock that he named Cherry Hill. I’m not clear exactly when he purchased it, and wonder if it was actually closer to 1880. This could be cleared up in property records at the state archives. Below it he established an orchard and farm. It was on both sides of South Othello Street between 37th Avenue South and 39th Avenue South, from Myrtle to Webster, with the house in the southwest corner. But those streets didn’t exist. This was in a remote area that must have been almost inaccessible. Initially he must have traveled by wagon roads over the ridge of Beacon Hill to the community of Georgetown and its rail connection to Seattle. But by the time the census surveyed him and his cook Lew Gank in 1900, the interurban from downtown Seattle on Rainier Avenue had been completed all the way to Renton. It was a modest walk on planked sidewalks from the Seattle, Renton & Southern railway’s Brighton Station (sometimes called Mathieson Station) on Rainier up to his home. Louch’s crop of fruit and vegetables would give him low-cost merchandise in the early years. I wonder if he turned it to seed production after his wholesale business made it a better use of his time to acquire produce on the open market. 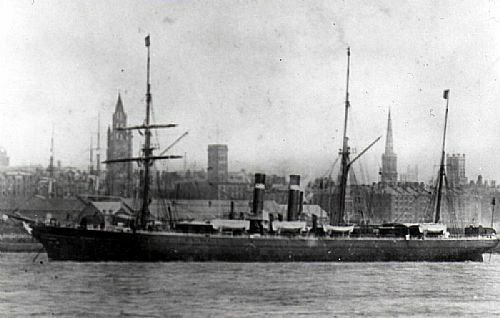 In 1903 Louch decided to return to England. In 1905 he sold his property to realtor and developer Alver Robinson. He subdivided the land into 72 home-sized parcels called Robinson’s Tracts and began advertising them for sale in 1907. Fifty sold in the first three weeks. In this 1912 Baist fire insurance map (downloaded from Paul Dorpat’s website) Robinson’s Tracts are visible in the top left. About a quarter of the subdivided properties hold buildings, a much higher density than the surrounding farmland. Louch’s former brick home is shown in pink in the bottom left in one large lot. Louch’s house was later owned by noted Seattle physician and Children’s Hospital administrator Dr. James B. Eagleson. By the Great Depression it was the home of Frederick & Nelson electrician Frank Merryman, his wife, and his son Albert. In 1934 they escaped a fire that gutted the building and destroyed all of the furnishings that Louch left with the house. In the below 1936 Aerial imagery, the location of Louch’s former home is indicated in purple. Orchards surround the home to the north and east. Across Othello Street remnants of farmland spread north to Myrtle Street. Charles Louch’s Rainier Valley estate seen in 1936 Aerial Imagery. King County iMap. Property Details. Within a few years the former Louch farmland below Cherry Hill was redeveloped as defense worker housing during World War 2. 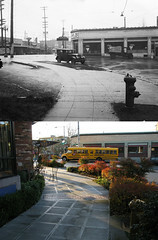 After the war the Seattle Housing Authority acquired the property as part of the Holly Park housing project. This was redeveloped recently into NewHolly, a community of mixed incomes as well as a mix of privately- and publicly-owned housing. One chunk behind the current Safeway on 39th Avenue South is a Union Gospel Mission ministry. There was no local train station for about 60 years. But when light rail opened on Martin Luther King in 2009 it created Othello Station a short walk from the edge of Louch’s old farm. Unfortunately none of the names of the area’s early residents were considered to name the station or any of the many new parks created with NewHolly (Central Park, Holden Park, etc). It’s tempting to concoct a conspiracy, perhaps that the housing authority was trying to forget the past in an attempt to create a completely new community. But I think the reality is simply that no one knew about the earlier residents. The amount of digging it took was astounding, and I still don’t know when he died. (Although I can say for sure he did not die on the Titanic.) Now once the neighborhood stumbles on this page they’ll know that they live on Charles Louch’s former farm, and realize how important he was as a grocer in 1880s to 1900s Seattle. That’s just one person, though. Who were his neighbors: Swanson, Graves, Lautenschlagen, and the rest of the farmers? I’ll leave that to the next historian to determine. On February 12, 1933 the Seattle Times ran the below photo, a circa 1888 view over the top of Charles Louch’s store in Seattle. The caption had many errors. It may have been due to bad note taking, but I suspect the writer was given the photo and the information by Henry Kyer, president of Augustine & Kyer. A&K was the successor to Charles Louch’s store. In case anyone else ever reads that article, I’ll leave this critique to help guide their research. Charles Louch opened his business by at least 1885. (not 1888, which is the name of his brand for unknown reason.) Apparently he had a store at 1st and Columbia soon after 1878. Also, is this really a picture of Seattle in 1888? The brand is 1888, not necessarily the photo. I’ve only seen it with a “circa” date. Comments on a now-off-the-Internet Vintage Seattle article narrowed it to between 1883 and 1890, with one person claiming the equipment necessary would be closer to 1890.